Ekushey Bangla Wikipedia Gathering, Comilla. Photo by Shahidul Hasan Roman, freely licensed under CC-BY-SA 4.0..
On 21 February 2018, Wikimedia Bangladesh hosted gatherings in 6 cities of Bangladesh (Dhaka, Chittagong, Rajshahi, Khulna, Sylhet and Comilla) to observe International Mother Language Day. Wikipedians of Bangladesh were standing in a public place with banners asking passersby to contribute to the Bangla Wikipedia and other Wikimedia projects. The day has a special meaning to Bangladeshis, as UNESCO established 21 February as International Mother Language Day as a tribute to those who were killed in the 21 February 1952 Bangla Language Movement demonstration and the ethno-linguistic rights of people around the world. The First gathering was held back in 2007 in Dhaka. Since then, Bangladeshi Wikimedians have been doing it annually. More images can be found on Wikimedia Commons. Ekushey Bangla Wikipedia Gathering, Dhaka. Photo by Sufe, freely licensed under CC-BY-SA 4.0..
Ekushey Bangla Wikipedia Gathering, Rajshahi. Photo by Masum-al-hasan, freely licensed under CC-BY-SA 4.0..
Ekushey Bangla Wikipedia Gathering, Sylhet. Photo by Ashiq Shawon, freely licensed under CC-BY-SA 4.0..
Ekushey Bangla Wikipedia Gathering, Khulna. Photo by Masum Ibn Musa, freely licensed under CC-BY-SA 4.0..
এখানে উল্লেখ্য, কে বিভিন্ন বিল পরিশোধ করবে এটা নিয়ে তাদের সাথে অনেক যুদ্ধ করতে হয়েছে — বাংলাদেশিরা তাদের অতিথিদের আপ্যায়ন করতে পছন্দ করেন, এবং তারা সবকিছুর বিল পরিশোধ করেন। আপনি বিল পরিশোধ করতে চাইলে আগে থেকে আপনাকে এ ব্যাপারে সতর্ক এবং চালাক হতে হবে! আমরা বাংলাদেশিদের কাছ থেকে (পুনরায়) শিখেছি যে, টাকা খরচ হওয়াই কোন আড্ডার, একসাথে কোন রেস্টুরেন্টে বসা, একসাথে নৌকাভ্রমণ কারার গুরুত্বপূর্ণ অংশ নয়, সবচেয়ে গুরুত্বপূর্ণ হলো একসাথে সময় কাটানো এবং নিজেদের মধ্যে অভিজ্ঞতা বিনিময়। এই শিক্ষাটি পুনরায় স্মরণ করিয়ে দেয়ার জন্য তোমাদের সবাইকে ধন্যবাদ! এছাড়াও, আমরা জেনেছি যে, স্বেচ্ছাসেবক হিসেবে কাজ করাকে সাধারণ মানুষ খুব একটা ভালো চোখে দেখেন না। ইউরোপ বা উত্তর আমেরিকার ঠিক উল্টো, এখানে অবিভাবক, বন্ধু-বান্ধব ও অন্যান্যরা এটিকে অ-কাজ হিসেবে বিবেচনা করে থাকেন। এটা জানার পর, আমার মনে হয়েছে, যদি আমি আরাম ও মজা করার জন্য খুব কম সময় পেতাম এবং সাধারণ মানুষের কাছ থেকে উইকিপিডিয়াতে অবদানের জন্য সাধুবাদ না পেতাম — তখনও কি আমি আমার অবসর সময়ে উইকিপিডিয়া এবং এর সহপ্রকল্পগুলোতে অবদান রাখতাম? প্রযুক্তি ও ইলেক্ট্রনিক পণ্যের অস্বাভাবিক মূল্য অন্য একটি সমস্যা যা বাংলাদেশি উইকিমিডিয়ানরা সম্মুখীন হন। যদিও জীবনধারণের খরচ এখানে বেশ কম কিন্তু অনেক সময় কম মজুরি পেয়েও ইলেক্ট্রনিক পণ্যের মূল্য তাদের অন্যান্য দেশের মত একইরকম পরিশোধ করতে হয় অথবা এটি অনেক সময় এগুলোর উপর ধার্য কর-এর কারণেও। উদাহরণস্বরুপ, অধিকাংশ মানুষের কাছেই ক্যামেরা নেই — এবং এর জন্য তারা নিজেদেরকে স্মার্টফোনে ছবি ধারণে দক্ষ করে গড়ে তুলেছে। এমন দক্ষ যে, সে ছবিগুলো ডব্লিউএলএম ছবি প্রতিযোগিতায় বিজয়ী হয়েছে। কিন্তু তারপরও স্মার্টফোন ব্যবহারও কিছুটা বিলাসিতা হিসেবে বিবেচনা করা হয় এবং আমি শুনেছি, এমন অনেক উইকিমিডিয়ান আছেন যার সাধারণ মোবাইল থেকেও উইকিপিডিয়ায় অবদান রাখেন। শুধু কল্পনা করুন, ভালো উপকরণ পেলে সেসব উইকিপিডিয়ানরা কি করবেন! আপনি যদি উইকিমিডিয়া বাংলাদেশ সম্পর্কে বিস্তারিত জানতে চান এবং এই দেশের চমৎকার সব অবদানকারী সম্পর্কে আরও ভালোভাবে জানতে চান, আপনি নিজেই তাদের সাথে যোগাযোগ করতে পারেন! সত্যিই, আপনার চমৎকার অভিজ্ঞতা হবে! Broad smiles, curiosity and an overwhelming hospitality are the first things that come to mind, when I remember my trip to the Wikimedia community in Bangladesh in November 2017. 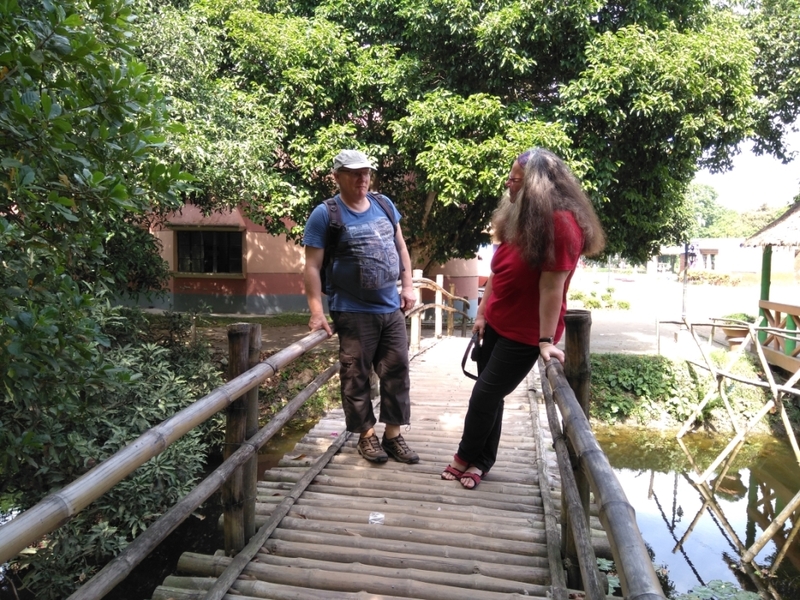 I was able to combine work with personal travels with my husband and spent almost four weeks visiting different parts of the country and meeting with Wikimedians from Bangladesh. 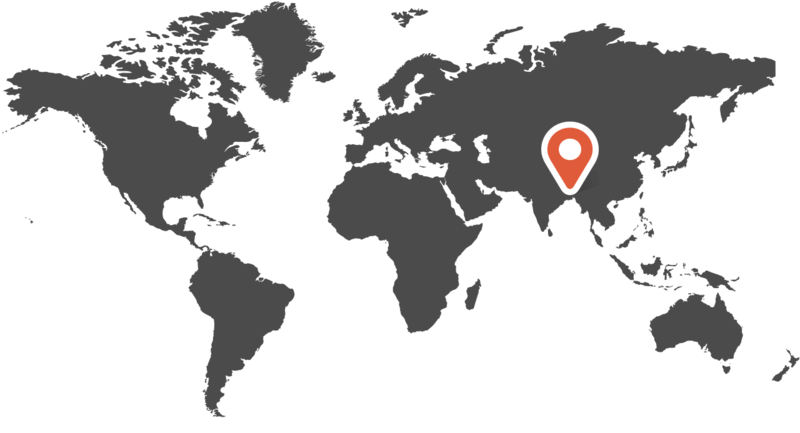 Three workshops about Wikipedia and Safety were held at convenient intervals in the capital city of Dhaka, the port city Chittagong and in the University city of Rajshahi. Between the workshops, I had time to explore the country, see its beauty, problems and most of all to socialize with the local Wikimedians and learn from them. Nahid Sultan, Moheen Reeyad and Masum al Hasan were of invaluable help to me. They helped organize things in advance and in situ. One or more of them was with us or available to us day by day, showing us things and people, the best places eat or drink tea, helping us get around, and giving me many hard fights on who is paying: Bangladeshis like to invite their guests and pay for everything, if you are not wary and crafty! They and other members of the community we met made us aware of how small minded we often are in splitting costs exactly. We (re-)learned from them that it is not the money spent that is most important about an outing, an evening in a restaurant, a boat ride together on a river, but the time and experiences shared together. Thank you all for that repeated lesson! And they did show us wonderful things! Together we went to Museums and impressive heritage sites, they organized group boat rides on the majestic, but unfortunately heavily polluted rivers of their cities (they found out quickly that I love boat rides), took us to the seaside and advised us on the best dishes, the best streetfood and the best places to buy souvenirs. We saw a splendid pink Mughal Palace, the National Martyrs' Memorial (a beautiful modern concrete structure in a lush garden), met poets, University teachers and artists as well as lots of Wikimedians, visited a deserted city, as well as a fascinating Hindu temple district in a lively village and so much more. They also provided opportunities for us to meet and talk with other Wikimedians at the free time between the workshops. The workshops were all three well-attended. 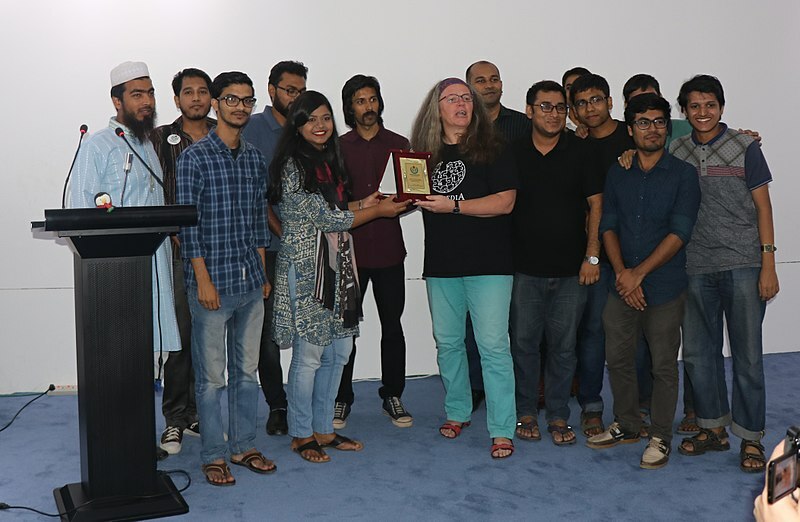 In Dhaka, there were more seasoned Wikimedians than in the other cities, as the event also included the prize giving ceremony for the two big photo competitions Wiki Loves Monuments and Wiki Loves Earth. In Chittagong and Rajshahi the workshops attracted also a lot of people that had not contributed to the projects before. What really made me happy, was not the numbers, but the way participants in all three workshops paid close attention, even in Rajshahi, where it was held in the evening and attended mostly by students who had already had a full day of classes. Even if asking questions from a foreigner like me visibly took some courage, participants came back with important questions — for example on how women can be safe at Wikimedia events, or how translating can be helpful to the Wikimedia projects. These events were an opportunity for us to learn about some of the challenges Wikimedians face in Bangladesh. 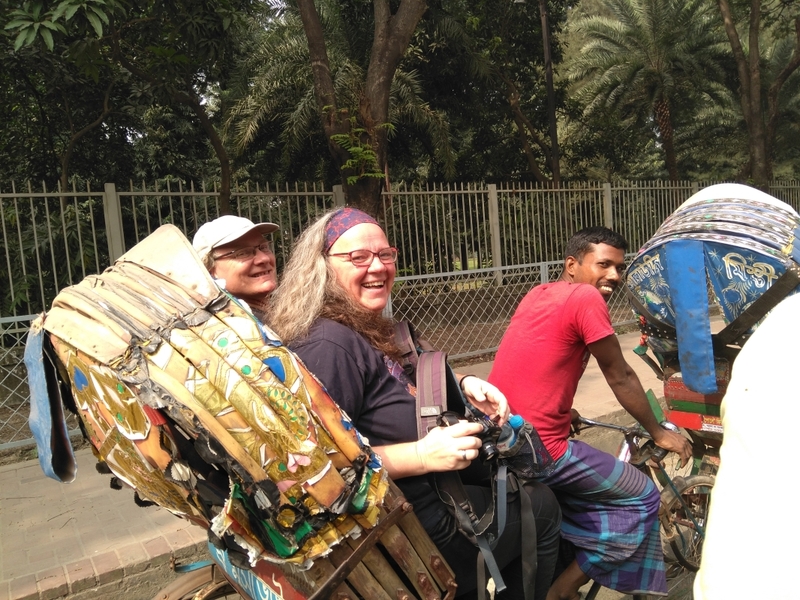 Already before, but also on the way to the workshop in Dhaka, we experienced the problems of getting around in Dhaka — traffic jams are a serious issue there and even short trips can take an hour or more. Similar to that there also a lot of other small things that just take more time and energy, than I, as a European, am used to. Things like shopping, or even crossing the street. In addition, most areas of Bangladesh suffer from repeated power outages and the internet is not reliable everywhere. Also, we were told, volunteering for an institution like Wikimedia is not regarded as something to be applauded by the general public. Parents, friends and strangers might not nod approvingly, as they often do in Europe or Northern America, but rather chide you for wasting your time, when you contribute to Wikipedia. It really made me wonder — if I had so little time for relaxation and fun and did not get public recognition for volunteering — would I still be willing to edit Wikipedia and its sister projects in my precious free time? Another challenge for Wikimedians in Bangladesh is the disproportionately high cost of technical equipment. While the cost of living and often the wages are comparatively low, all electronic equipment costs about as much as in other countries, or even more because of taxes. Cameras for example, are not something most people own — and because of this, some have trained themselves in making excellent pictures on their smartphones. So good, they even get awards in the national photo contest of WLM. But even smartphones are a kind of luxury and I have heard of users editing Wikipedia extensively from a normal cellphone. Just imagine what more these people might do with good equipment! Despite all the challenges, the Users in Bangladesh are very active. The editors community is not a big one, I was told around 150 to 200 very active contributors. But they, with Wikimedia Bangladesh, the independent Wikimedia chapter, take an active part in the international community, where they serve as Stewards, Affiliations Committee members and admins on Wikimedia Commons. They organize wonderful events and even if they are not many - they spread enthusiasm and Wikilove. 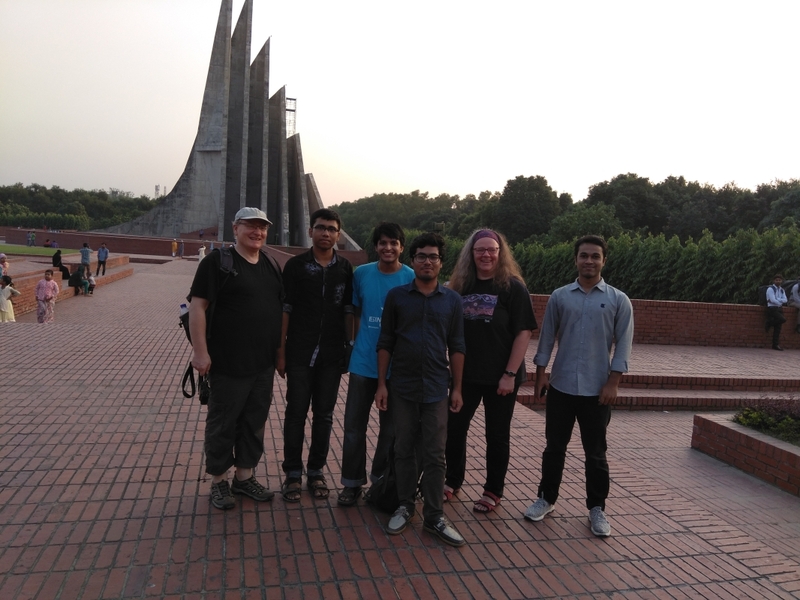 If you want to learn more about Wikimedia in Bangladesh and get to know some of the wonderful contributors from this country a bit better, you can contact them yourself! Be bold, it is worth it! Baitul Aman Jame Masjid also known as Guthia Mosque, located at Wazirpur in Barisal, Bangladesh. Photo by Azim Khan Ronnie, freely licensed under CC-BY-SA 4.0..
Bangladesh has taken part in the international Wiki loves monuments (world's largest) photography competition for the second time in September 2017. During the competition, a total of 119 Bangladeshi participants uploaded more than 3000+ freely licensed photographs of 200+ different monuments and sites in Wikimedia Commons. Among all the participants, 61% were new to Wikimedia projects and 8% of them were women. Many of the photographs uploaded in the contest are now being used to illustrate Bangladesh related Wikipedia articles. Out of the 3000+ photographs, the jury [note1] of the Wiki Loves Monuments Bangladesh Contest have selected the 10 winning photographs. Friday Prayer at Baitul Mukarram National Mosque. Photo by Azim Khan Ronnie, freely licensed under CC-BY-SA 4.0.. Inside view of Baitul Mukarram National Mosque. Photo by Jubair1985, freely licensed under CC-BY-SA 4.0..
Kamaruzzaman Chattar Monument, Rajshahi. Photo by Mmrsafy, freely licensed under CC-BY-SA 4.0..
Bangabandhu Bridge also known as Jamuna Multi-purpose Bridge. Photo by Rohul Amin Khan, freely licensed under CC-BY-SA 4.0.. Inside view of Darasbari Mosque, a historic mosque that was built in 1479 AD. Photo by Porag61, freely licensed under CC-BY-SA 4.0..
Hardinge Bridge. Photo by Azim Khan Ronnie, freely licensed under CC-BY-SA 4.0..
Shahid Minar, University of Rajshahi. Photo by Nahid Hossain, freely licensed under CC-BY-SA 4.0..
National Martyrs’ Memorial, Savar, Bangladesh. Photo by Farruk Ahmed Bhuiyan, freely licensed under CC-BY-SA 4.0..
Lalbagh Fort, an incomplete 17th century Mughal fort complex. Photo by Shafin Khan, freely licensed under CC-BY-SA 4.0. [note1]: The jury of Bangladeshi competition consisted of 3 experienced photographers from three different countries. They were: Rifat Jamil Eusufzai, Selbymay and Basotxerri. উইকিমিডিয়া বাংলাদেশ: আপনি উইকিপিডিয়ার সাথে কিভাবে জড়িত হলেন? উইকিমিডিয়া বাংলাদেশ: মজার ঘটনাটি শুনতে চাই? উইকিমিডিয়া বাংলাদেশ:উইকিপিডিয়াতে আপনি মূলত কোন বিষয়ে লিখতে পছন্দ করনে? উইকিমিডিয়া বাংলাদেশ: উইকিপিডিয়া বা উইকিমিডিয়ার অন্য প্রকল্পগুলোতে আপনার কাজের ধরণ সম্পর্কে বলুন? উইকিমিডিয়া বাংলাদেশ: আপনার মতে, উইকিপিডিয়াতে আপনার সাথে অন্যান্য ব্যবহারকারীর সম্পর্কের ধরণটি কেমন? উইকিমিডিয়া বাংলাদেশ: আপনি বাংলা উইকিপিডিয়াতে বেশি অবদান রাখেন। কেন বাংলা উইকিপিডিয়াকেই বেছে নিলেন? উইকিমিডিয়া বাংলাদেশ: আপনার মতে, উইকিপিডিয়াতে রাখা আপনার সেরা অবদান? উইকিমিডিয়া বাংলাদেশ: বাংলা উইকিপিডিয়ায় কোন কোন বিষয়ের বিষয়বস্তুর অভাব রয়েছে বলে আপনি মনে করেন? এবং সেটা কিভাবে ঠিক করা যায় বলে আপনি মনে করেন? উইকিমিডিয়া বাংলাদেশ: বাংলা উইকিপিডিয়াকে ১০ বছর পর কেমন দেখতে চান? উইকিমিডিয়া বাংলাদেশ: নতুন যারা উইকিপিডিয়াতে কাজ করতে আগ্রহী তাদের আপনি কি পরামর্শ দেবেন?